You may still be able to book by calling the hotel at 703-418-1234. 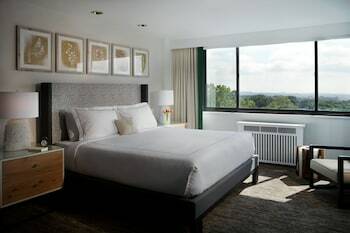 Whether you're planning an early flight out of Reagan National Airport or in town on official government business, the Hyatt Regency Crystal City is a great option amongst Arlington's many different lodging choices. There's plenty to do and see in the area, including taking a tour of the Pentagon and paying your respects to some of the country's most notable patriots at Arlington National Cemetery. If you're looking to explore or do some business in the nation's capital, there's a complimentary Reagan Airport shuttle that'll also take you to the nearby Metro station, for an easy ride into the city. The hotel has nearly 700 guestrooms featuring signature pillow top mattresses, iPod docking stations and available wireless Internet access. Comfort and location come together at the Hyatt Regency Crystal City. 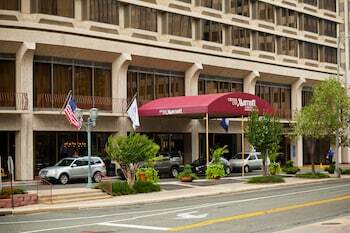 Hyatt Regency Crystal City is a 3.5-star hotel located at 2799 Jefferson Davis Hwy, Arlington, VA 22202, US . Its nightly price usually falls between $63 per night and $529 per night, excluding tax, depending on room category. $63 per night found for a Room, 2 Double Beds, Accessible (Shower) room type. Hyatt Regency Crystal City sells rooms through sites like Room 77, Expedia, Hotels.com, GetARoom, and many others. Room 77 searches across dozens of different sites to find the lowest discount rates available. The lowest rate we've seen over the last few weeks was found on Room 77. In 1% of the cases we surveyed, all sites offered the same rate. You can compare real-time rates from all of these sites on Room 77. Room 77 is the only hotel shopping site that includes special discounts like AAA, senior, government, military, and corporate rates.